The Four Dog Fig Farm: Culinary Chronicles: Molé Pizza with Arugula, Apple and Bacon. 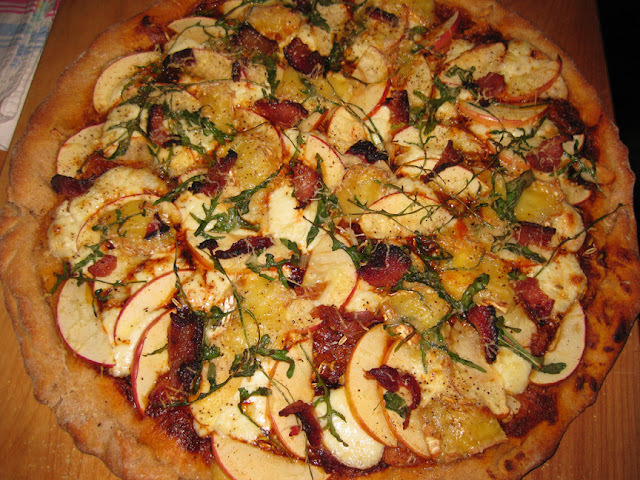 Culinary Chronicles: Molé Pizza with Arugula, Apple and Bacon. I think I'm on to something here. 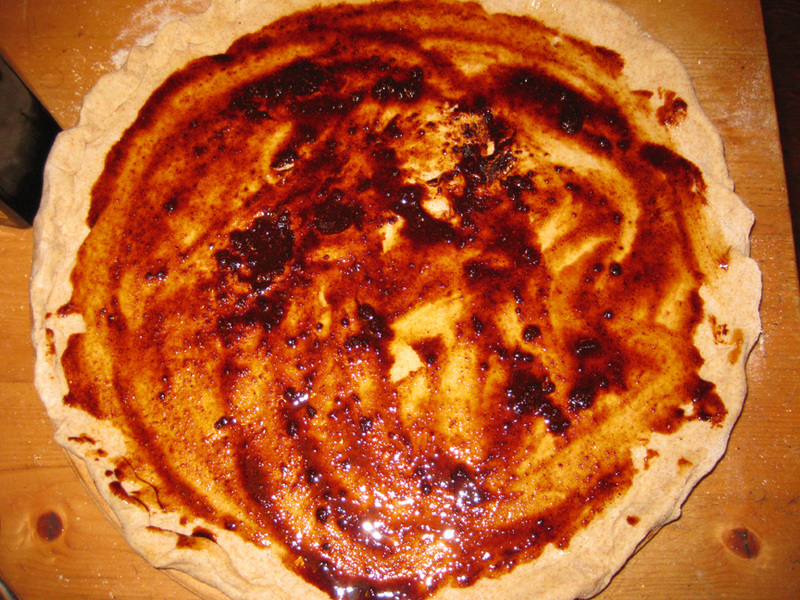 I made a pizza last week that used prepared molé sauce instead of a tomato sauce or pesto. I'm sure someone else has thought of this, but I'd never heard of it. (Google tells me I'm right, of course others have tried it, but most seem to have kept it Mexican in theme, and I took it in a totally different direction). It was good! As I've talked about before when I made tamales early in the year, I think the prepared molé that I can get at Pro's Ranch Market deli section is better than the brands like Dona Maria that are available in most supermarkets. It's got a pretty high cinnamon flavor to me, but is still (hot) spicy too, and so toppings would have to adjust according to the exact flavor of your molé. I topped my pizza with garlic, ricotta, apple slices, fennel seeds, brie cheese, arugula and bacon. This is what it looked like spread on the crust. Not too much because its got a lot of flavor. 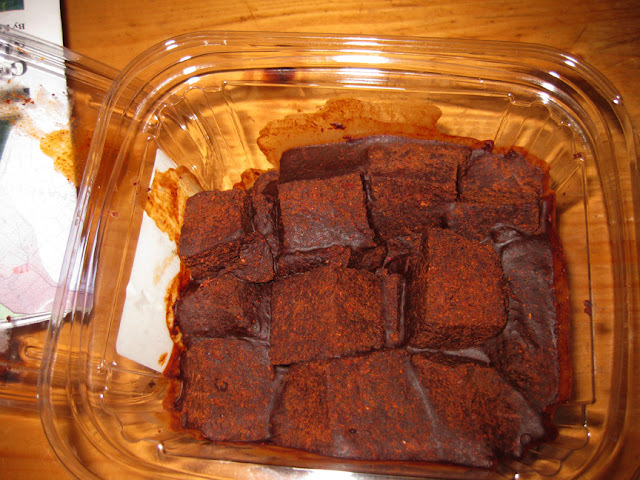 It comes as a dry cube, so I blended it with just a little oil before it was spreadable like above. 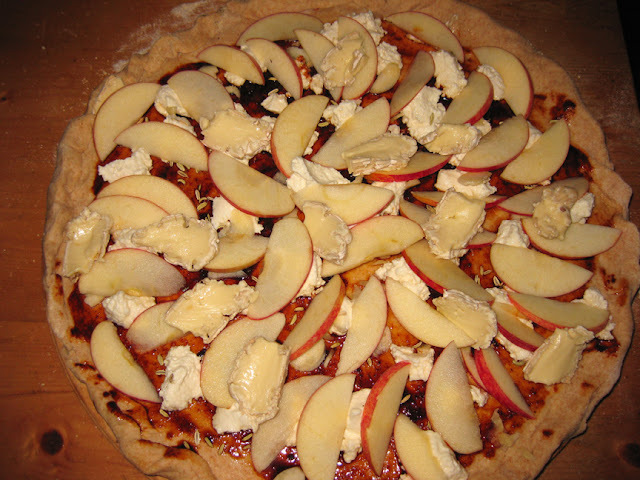 Next I layered on the garlic slices, cheeses, apple and fennel seeds. Finally the bacon and arugula. 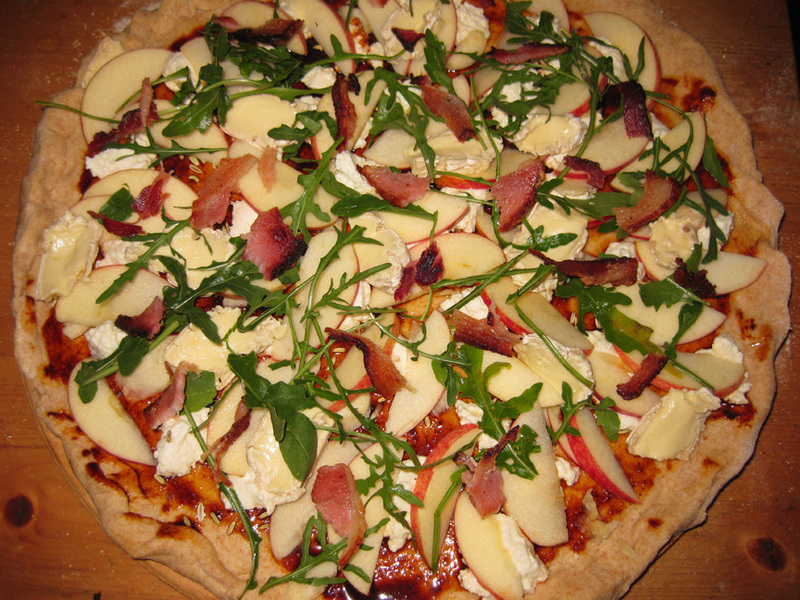 The bacon is apple smoked and the arugula rather bitter, which I thought contrasted nicely with the sweet spiciness of the molé, sweetness of the apple, and creaminess of the cheese. The finished product. I would have added a bit more arugula if I'd had it since it baked down to almost nothing. The molé would be great with pineapple too. I recommend this highly. Let me know if you give it a try, and what you combine it with.